Broccoli Rabe Pancetta Pasta is a hearty pasta recipe that will warm you up on a chilly evening. This Italian recipe, bursting with nutritious broccoli rabe and bits of flavorful pancetta, will transport you to Italy in your very own kitchen. 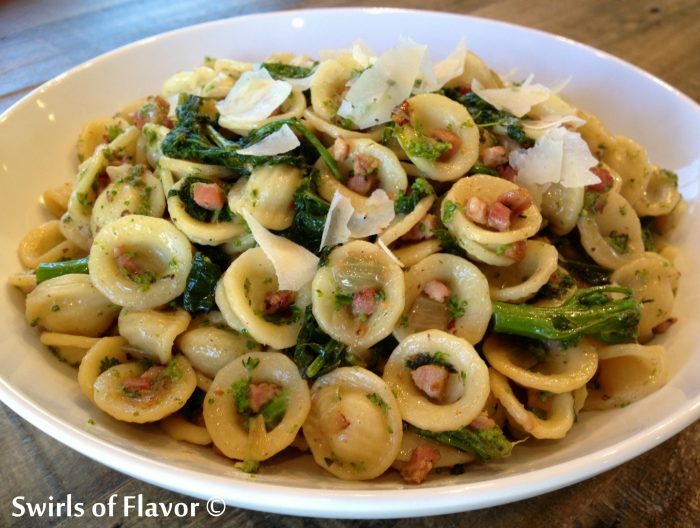 Orecchiette pasta, shaped like “little ears”, catch the bits of broccoli rabe, onion, garlic and pancetta for your every bite! Broccoli rabe is one of my absolute favorite vegetables and I hope it will soon become yours too! Typically associated with Italian cuisine and several regions in Italy, broccoli rabe has a nutty and slightly bitter flavor. It is not only an excellent source of vitamins A, C and K but also contains potassium, calcium and iron. Sounds like another super food to me! The edible parts of this cruciferous vegetable are the leaves, buds, and stems. The buds somewhat resemble little broccoli florettes, but do not form a large head. Be sure to trim off the tougher parts of the stems before using. 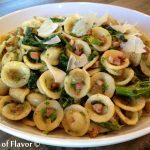 Pancetta, the ever delectable Italian style bacon, elevates this recipe to another level of fabulously delicious and the orecchiette pasta, shaped like “little ears”, catch the bits of broccoli rabe, onion, garlic and pancetta for your every bite! Love the pancetta in this pasat recipe? 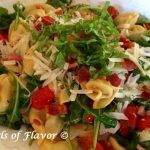 Then you’ll want to try Skillet Tortellini Pomodoro With Pancetta in a light buttery garlic white wine sauce is studded with crispy bits of pancetta, sautéed tomatoes and fresh arugula and basil. 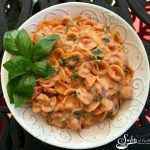 One Pot Creamy Tomato Basil Pasta makes it’s own velvety tomato sauce and gets it’s creaminess from a secret ingredient….cream cheese! And pasta is it’s most delicious when it’s homemade! 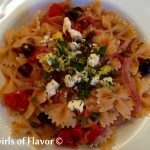 And it’s easier than you think with my Homemade Pasta recipe! Broccoli Rabe Pancetta Pasta is a hearty pasta recipe that will warm you up on a chilly evening. This Italian recipe, bursting with nutritious broccoli rabe and bits of flavorful pancetta, will transport you to Italy in your very own kitchen. Orecchiette pasta, shaped like "little ears", catch the bits of broccoli rabe, onion, garlic and pancetta for your every bite! Cook pasta according to package directions for al dente. Drain, reserving 1/2 cup of pasta water. Meanwhile, heat large non-stick skillet, preferably with tall sides, over medium heat. Cook pancetta, onion, garlic, kosher salt and pepper flakes until pancetta is browned and onions are tender, 5-7 minutes, stirring occasionally. Add white wine. Boil 1 minute. Add broccoli rabe. Cook, covered, until wilted and tender, 8-10 minutes, stirring occasionally. Add butter, cooked pasta and reserved pasta water. 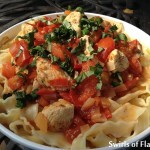 Cook until butter has melted and pasta is heated through, 2-3 minutes, stirring occasionally. Makes 4 servings (5 cups). Prepackaged diced pancetta can be found in the refrigerated section of your supermarket. Not available in your supermarket? 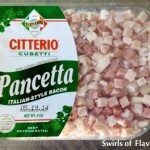 Just buy a 4 ounce piece of pancetta in the deli department and cut into small diced pieces.